The Cold War began even before the hot war was over. Until the Trinity device was successfully tested on July 16, 1945, the Army consistently advised President Roosevelt that he could not depend upon the atomic bomb. Throughout the war the United States believed that victory depended upon the support of the Soviet Union to fight Hitler in the West and Japan in the East. Despite the February 1945 agreements at Yalta that free elections would be held in all of the liberated European countries, Stalin apparently never intended to keep his word. By mid-March 1945, Winston Churchill wrote to Roosevelt that everything in Europe supposedly settled at Yalta had broken down. In March 1946, Churchill delivered his famous "iron curtain" speech. By 1947, Western Europe was on the verge of disintegration and the Soviet Union was ready to take advantage of the situation. The Truman Administration concluded that only by building up an effective atomic arsenal could it convince the Soviet leaders that they could not continue to prey on struggling nations and provoke another world war. 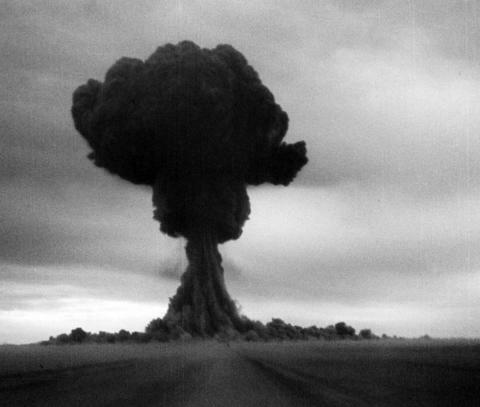 In August 1949, the Soviet Union had tested its first nuclear weapon and was suspected of developing a hydrogen bomb. The Soviets' detonation of "Little Joe" sparked a renewed sense of national urgency that was reinforced in 1950 by the outbreak of the Korean War. In January 1950, President Truman made the controversial decision to continue and intensify research and production of thermonuclear weapons. Soon, the country would be engaged in the largest construction project in peacetime history, vastly expanding the facilities for producing special nuclear materials and weapons. The build-up consisted of a new plutonium production plant at Savannah River in South Carolina, gaseous diffusion plants at Paducah, Kentucky and Portsmouth, Ohio, a plant to produce uranium fuel rods at Fernald, Ohio, a plant to make plutonium pits at Rocky Flats, Colorado, and an assembly plant for nuclear weapons at Pantex near Amarillo, Texas. The Nevada Test Site was set aside for testing in 1951 and a second nuclear weapons laboratory, Lawrence Livermore Laboratory, was opened in 1952. In August 1953, the Soviets announced they had developed the thermonuclear bomb. "Joe 4," as Americans called the first Soviet hydrogen bomb, represented a massive increase in the Soviet's destructive capacity. Partly in response to this development, President Eisenhower addressed the United Nations General Assembly with his now famous "Atoms for Peace" speech on December 8, 1953. Concerned about the escalating nuclear arms race, the President urged that nuclear nations begin making joint contributions of nuclear material to an International Atomic Energy Agency (IAEA) to be established under the United Nations. By the time he left office, the IAEA was a reality, established to prevent the proliferation of nuclear weapons and promote the broadest use of nuclear electric power.